The Minecraft video game has over 100 million registered users, and allows players to mine for resources and build what ever they like. This quarter MAE3 students will compete in a Minecraft inspired challenge and build actual robots to mine and craft! There will be mine shafts of iron ore with a few treasured diamonds on the playing field. 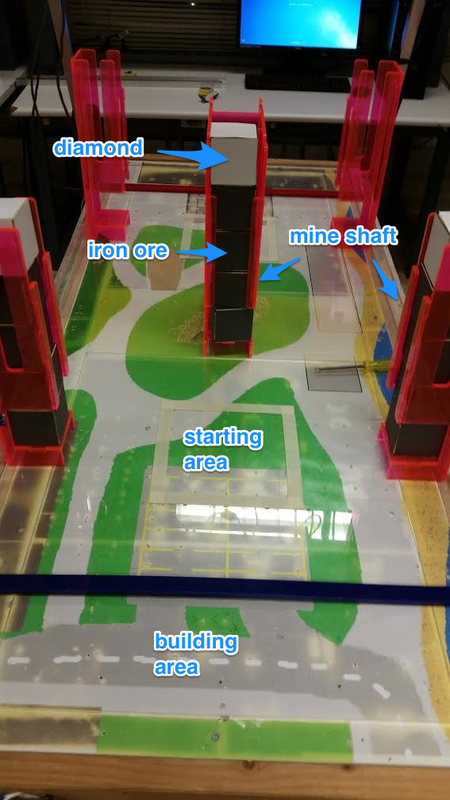 Each team will build robots that will extract these resources from the mine shafts and build their structures. The goal is to build the highest structures with double points for diamonds. Students will attempt to stack as many ore as high as possible in their building area. There are two types of ore, diamond and iron. Diamond is worth twice as many points as iron. The higher the block, the more points it is worth. The first row is worth 1 point each, second row 2 points, third row 3 points, etc... Remember, Diamonds are worth twice as much points! o Have at least one part of it touching the floor inside the building area. o Have at least one part of it inside the building area. • Boxes can be partially outside the building area. The robots will be arbitrarily assigned to start in either the right or left starting areas. The contest will be held during the MAE finals period and will be open to the public. The contest will be held in a single elimination fashion (like a tennis tournament). During the lab period of the last week of classes, each section will hold a section-wide contest. The results of this contest will be used to seed the placement of the final contest. Thus teams that perform better during their section contest will have statistically easier contests in the early rounds. Since the number of teams in the class will not be exactly a power of 2, the higher seeded teams may get a "buy" during the first round. If necessary "wild card" teams will be selected to have a second chance in the contest, to ensure that all pyramid spots are filled. Umbilical Cables: The electrical connections will made to a single umbilical cord hung from above the table; one on each side of the table. The umbilical cord cannot be touched during the contest, and there will be some drag from the cable. Each machine must be designed to overcome this drag if necessary for motion of the machine. If requested a TA can ensure that the umbilical cable does not snag. A playing piece will be declared out-of-bounds if it is off the playing field.